It’s Tuesday. Let’s talk Jane Austen. Summary: Twenty-seven-year old Anne Elliot is Austen’s most adult heroine. Eight years before the story properly begins, she is happily betrothed to a naval officer, Frederick Wentworth, but she precipitously breaks off the engagement when persuaded by her friend Lady Russell that such a match is unworthy. The breakup produces in Anne a deep and long-lasting regret. When later Wentworth returns from sea a rich and successful captain, he finds Anne’s family on the brink of financial ruin and his own sister a tenant in Kellynch Hall, the Elliot estate. All the tension of the novel revolves around one question: Will Anne and Wentworth be reunited in their love? I read this for the first time several years ago and, honestly, wasn’t a big fan. I found Anne boring and the plot slow. Looking back, I think my impression was influenced strongly by the 1995 film adaptation, which I disliked. Several years and a literature degree later, I picked Austen’s last completed novel for another go. And, honestly, I can’t believe I ever disliked it. I can’t even bring myself to rate the novel, I loved it so much. 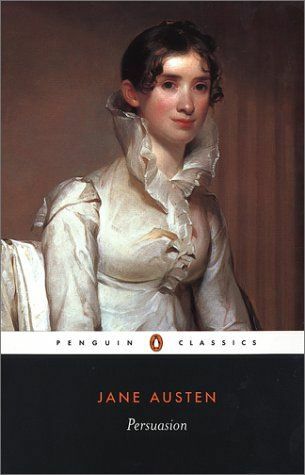 This time through, I paid less attention to the love story and more to the social commentary and critique that Austen does so well. Anne Elliot is a wonderful heroine. Filled with intelligence, gentleness, and wisdom, she is surrounded by people who do not appreciate her. A lady of high birth, her father and elder sister are vain and over-concerned with issues of status and appearance. Her married sister is foolish, selfish, and hysterical and, though the neighboring Musgrove family are her good friends, their boisterous natures prevent them from paying Anne too much mind. Instead of resenting always being shoved to the side and never getting the spotlight, Anne willingly steps aside, happy and content to soak in the friendship of others. Her strength and constancy helps her make the most of every situation. Eight years after being persuaded to break off an engagement with the dashing, Captain Wentworth, Anne finds herself once more in the company and social circle of her former love. The problem is, Wentworth treats her with cool indifference and clearly hasn’t forgiven her for breaking his heart. In the meantime, he spends his time pursuing Henrietta and Louisa Musgrove, determined to leave his history with Anne behind. Anne, an intuitive and a careful observer, is forced to endure his dismissal and her still-roiling emotions in silence. Of course, because she is almost universally taken for granted, no one bothers to probe beyond her surficial feelings and discover the truth. She bears her pain regally, with grace and poise, accepting the consequence of her long-regretted decision. I adore Anne for her meekness. Being meek is often seen as a weakness–but I don’t think so. I define meekness as strength under control. Anne Elliot is an incredibly strong woman, but she holds it back. I’m inspired by her ability to maintain her countenance while feeling severe emotional confusion and pain. She is wise, gentle, and incredibly selfless. She, above all, is most deserving of love, but also the most willing to sacrifice her needs for the good of others. I honestly want to reach into the novel and smack all the characters until they learn to appreciate her. Ultimately, Wentworth is able to overcome his resentment and is one of the few characters who sees Anne for the incredible woman that she is. Persuasion is a novel about forgiveness. It is a story about change, about pain, and about weathering hardships. Often referred to as Austen’s most mature novel, it’s about remaining steadfast even when there is no hope. It’s the kind of novel that gets better as you grow older. I’m sure that, the next time I read it, I’ll notice something new, something deeper, and fall a little more in love. It’s been a few years since I’ve read Austen. I had her entire collection finished by the time I graduated high school, but revisiting her works post-college has enabled me to appreciate her in an entirely new light. Yes, her love stories are timeless and splendid. But Austen is so much more than that. She’s got an incredible eye for social critique through her characters. Heroines and their beaus aside, the background characters are really where the flavoring is. Through the various individuals, Austen is able to point out absurdities and contradictions regarding social class and decorum. She is scathing to Anne’s father and elder sister for their pompous vanity and disregard for those beneath them. She paints the complex relationship between love and irritation through Mary, her unintentionally selfish, hysterical younger sister. Through the Musgroves, she shows that good character often outshines minor failures and Lady Russell shows that advice, no matter how well-intentioned, should not always be listened to. Most people would love to meet their favorite authors, but I don’t think I’d want to know Jane Austen. I’d probably end up as a character in her book. Knowing my luck, I’d probably be an endearing cat lady. Check out a fan-made trailer for the 2007 movie. The quality isn’t great, but that aside, it does a great job of highlighting the adaptation. See you next week for another book talk!